(1977 'Delmark') (37:47/08) Von Produzent Ralph Bass 1977 aufgenommenes Album, daß leider nicht 100% überzeugt; insbesondere der schrille Harpsound fällt mir auf den Wecker / recorded in '77 this album remained in the vaults until now. 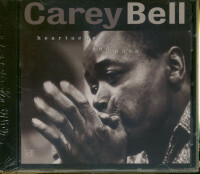 I am not too happy with it, and I can't stand Carey's shrill harp sound too long. CAREY BELL - hca/voc, LURRIE BELL(!) - gtr, ALABAMA Jr. PETTIS - gtr, BOB RIEDY - pno, AARON BURTON - bass, SAM LAY - drums. 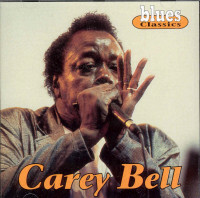 In his early Chicago years, Carey Bell learned from maestros Little Walter Jacobs and Big Walter Horton, also working as a bass player while refining his harp skills. 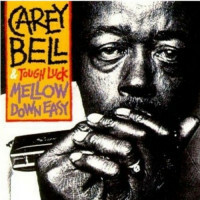 His talen and adaptability led to dozens of sessions over the years backing up everyone from Muddy Waters and Willie Dixon to the Staple Singers. Carey Bell is a true patriarch of Chicago blues and, in the words of his longtime European promoter Horst Lippman, "the Senior Master of the blues harp." Customer evaluation for "Heartaches And Pains"